Following the 2009 hijacking of the U.S.-flagged Maersk Alabama and kidnapping of its captain, rethinking the existing framework for combating piracy off the coast of Somali was next to inevitable. The Maersk Alabama hijacking not only raised questions about the size and capabilities of existing military deterrence efforts, but it also sparked discussions of increasing private security aboard shipping vessels. Since the introduction of private security aboard shipping vessels, the number of successful piracy attacks has steadily decreased. However, despite the steady decrease, counter piracy actors were calling for an expansion of the counter piracy framework to include strategies for combating piracy onshore in Somalia. In addition, counter piracy programming began seeping into the mandates of organizations that did not traditionally address piracy. The simultaneous expansion of the international counter piracy regime was co-constitutive of a growing sense of pirate mania. Until now, the geopolitics, actors, and motives behind these intersecting phenomena have not been examined in depth. Brittany Gilmer fills this gap in her book on Political Geographies of Piracy, which was published by Palgrave Macmillan in October 2014. Political Geographies of Piracy is an organizational ethnography about the increasing role of development organizations in (re)shaping political geographies of piracy. Drawing upon unique insider knowledge, it examines the inner-workings of the newly emergent ad hoc institutional arrangement for combating piracy at the intersection of security and development. Specifically, it analyses the sectors and organizations participating in the drafting and implementation of the United Nations Office on Drugs and Crime Counter Piracy Programme (UNODC CPP, currently the Maritime Crime Program) anti-piracy messaging campaign to demonstrate how manufactured narratives, identity constructions, and gendered practices are central to the project of combating piracy onshore in Somalia. 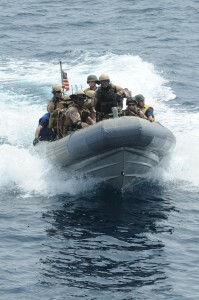 The processes and practices associated with the anti-piracy campaign also underscore how the reconstruction of threats and expertise are not only reshaping the spatial and temporal geographies of counter piracy, but are also contributing to the production of a thriving security and development market in Somalia. Somalia’s long, complex history of international intervention is rooted in and reinforces a single representation of Somalia as an insecure, underdeveloped and dangerous state in need of assistance. Somali piracy can be added to the growing list of issues that attracts international actors who utilize Somalia’s label as a failed state in order to justify external intervention. From 2008-onward high-profile piracy attacks, a spike in international media coverage, and a drastic increase in counter piracy spending all contributed to the current period of pirate mania; in particular, Somali pirate mania. Various international and Somali-based actors helped create and perpetuate a global discourse that reframes piracy from a criminal justice issue into a security and development threat. The global discourse surrounding Somali piracy was coordinated and materialized into a United Nations-facilitated anti-piracy messaging campaign for implementation in Somalia. A close look at the inner workings of a United Nations counter piracy office, as well as the partners and politics involved in designing an anti-piracy messaging campaign, explores how organizational and personal politics reworked the design, implementation timeline, and location(s) of the messaging campaign. Consequently, the messaging campaign became a conduit for reshaping identities, reinforcing political geographies, and pushing broader goals of combating piracy on shore in Somalia. An examination of the nascent stages of operationalizing the messaging campaign reveals the gendered nature of counter piracy practices taking place on the ground in Somalia. Throughout the messaging campaign design process, Somali women’s piracy-related concerns were often silenced. The concern most often raised by Somali women was preventing young women and girls being lured into relationships with pirates. According to the women’s testimonials, rumors that wealthy pirates were looking for wives was contributing to an influx of women and girls leaving their homes and families to seek out these relationships in coastal areas. However, rather than being wed to wealthy pirates, these women and girls often found themselves in situations involving physical abuse, drug abuse, and prostitution. Somali women wanted the messaging campaign to raise awareness about this issue and expose the realities of “relationships” with pirates. Even though the messaging campaign did not consider Somali women part of the piracy problem, they were considered part of the solution. As part of the solution, the messaging campaign framework and discourse simultaneously drew upon and reinforced particular gendered practices of social reproduction. These practices became tied to broader goals of creating and maintaining traditional, pirate-free communities in Somalia. For example, Somali women were encouraged to focus their energies on raising “good Muslim men” by preventing their sons from joining piracy. Mothers were tasked with preventing boys from becoming pirates and preventing girls from becoming romantically involved with pirates. Motherhood became the first line of defense against piracy. These preventative measures demonstrate how security measures were aimed at influencing actions in the private realm—within the home. As a result, the manipulation of gendered practices became a central component of combating piracy onshore through the messaging campaign. Blurred boundaries were also central to the security-development strategy for combating piracy onshore in Somalia. The strategy relied upon blurring the boundaries between bodies marked as pirates and bodies marked as potential pirates. The experiences of two different groups of marked bodies—Somali fishermen and Somali pirates—demonstrate how markings worked to criminalize or decriminalize bodies, mobilize or immobilize bodies, and produce developable and containable bodies in Somalia. Interviews with Somali fishermen in Berbera, Somalia and piracy prisoners in Montagne Posse Prison, Seychelles illustrate how these markings were promoted or resisted in order to reclaim territories and rights amidst the fight against piracy. Somali fishermen from Berbera began carrying fishermen identification cards while at sea. These cards not only helped establish their “legitimate” right to be on the water, but they also helped solidify the boundary between their bodies and those of pirates pretending to be fishermen. In contrast, convicted Somali piracy prisoners serving their sentences in Montagne Posse Prison attempted to blur the boundary between their bodies and those of fishermen. They insisted upon their innocence and argued that they were fishermen mistaken as pirates and arrested by foreign navies. Similarly, many piracy prisoners also attempted to blur the realities of their age and insisted that they were under the age of eighteen. They learned that international prison standards prevent minors from being held in prison and that minors would be processed and repatriated to Somalia. The inability of the counter piracy actors to officially confirm the age of suspected pirates created a loophole that was quickly exploited. A forty year-old pirate could claim to be seventeen unless proved otherwise. The burden of proof rested upon the counter piracy actors and prison staff. The new security-development framework for combating piracy also impacts the individuals, agencies, and sectors involved in designing and implementing counter piracy projects. The opportunities and challenges associated with conducting counter piracy projects on shore in Somalia are reworking the organizational structures, mandates, and partnerships for combating piracy. Although there may be an increasing collaboration at the regional and international level, within the development realm, money-strapped agencies are fighting amongst each other in order to obtain their piece of the counter piracy pie. Paradoxically, the political economy of combating piracy is creating markets of security and development in Somalia where those participating in the process of combating piracy also have a vested interest in its continuation. The findings suggest that (re)framing piracy as a security-development issue played a role in its construction as an imminent threat and shaped responses to it. What differs from previous expert visions of security and development in Somalia is the push for prevention and containment strategies. Counter piracy actors, including the development sector, are complicit in producing markets of security and development that promote the containment of particular actions and bodies in Somalia. A close examination of how and why these markets are being produced demonstrates that those who have an interest in combating piracy also stand to profit from its continuation. Consequently, the reproduction of the continuous, immanent threat of piracy is co-constitutive of the reproduction of the continuous need for intervention. This paradox exposes the “messiness” (i.e., the limitations, contradictions and cyclical nature) underlying the new security-development approach to combating piracy. It also suggests that the merging of security and development has enabled First World countries to use spaces of development as tools to contain Third World bodies within Third World borders. Bueger, Christian. 2012. “Drops in the Bucket ? A Review of Onshore Responses to Somali Piracy.” WMU Journal of Maritime Affairs 11(1): 15–31. Bueger, Christian. 2013. Responses to Contemporary Piracy: Disentangling the Organizational Field, in Douglas Guilfoyle (ed.) Modern Piracy: Legal Challenges and Responses. Cheltenham: Edward Elgar, 91-114. Flynn, Brendan. 2014. Counter-Piracy Lite? The EU’s ‘Soft’ Maritime Security Drive in the Gulf of Guinea. Piracy-studies.org. Gilmer, Brittany. 2014. Political Geographies of Piracy: Constructing Threats and Containing Bodies in Somalia. London: Palgrave MacMillan. Brittany V. Gilmer is an Assistant Professor at the Department of Criminal Justice, School of International and Public Affairs, Florida International University. Her PhD on Somali piracy was earned at the University of Toronto’s Department of Geography and Programme in Planning. It was nominated as a 2014 national finalist for the prestigious J. Warren Nystrom Award for the best dissertation in the field of geography. Dr. Gilmer also worked as a consultant for the United Nations Office on Drugs and Crime (UNODC) high profile regional office dedicated to enhancing rule of law and combating maritime piracy, terrorism, human trafficking, drug trafficking, and corruption in the East African region. While working for the UNODC, Dr. Gilmer travelled frequently to Somalia where she designed and implemented counter-piracy awareness campaigns, managed piracy prisoner database systems, promoted the international Piracy Prisoner Transfer Programme, and served as a principal UNODC contact for the Counter-Piracy Coordination Offices in Somaliland and Puntland. Dr. Gilmer also assisted with creating police and prison officer training materials for use in regional training workshops and toured prisons throughout Somalia, Kenya, and the Seychelles where piracy prisoners are being held.